17 February 2017, at 6:00a.m. Dietary potassium diformate (KDF) has been widely applied in pig production for almost 20 years and has been reported in numerous publications and conference contributions, for its use in sows, piglets and fatteners, writes Christian Lückstädt, Addcon. It was the first organic acid salt to be approved as a non-antibiotic growth promoter in pig feed in the European Union, where it has been shown to improve growth performance and feed efficiency in pig production in several efficacy trials. 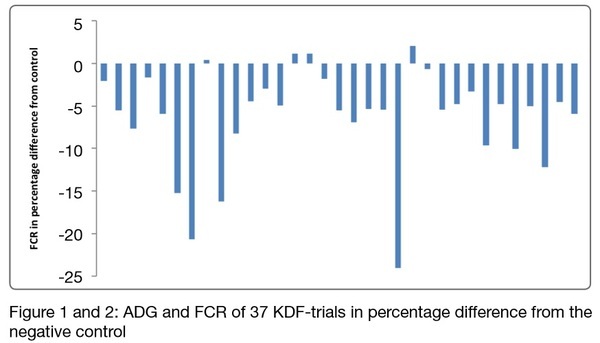 A holoanalysis of all published data on KDF (traded as FORMI) under temperate conditions (n=59) demonstrated that the additive significantly improved feed intake (+3.52%), weight gain (+8.67%) and FCR (-4.20%) compared to negative controls. As a result of its success in Europe, it has also subsequently been tested under tropical conditions. Material and methods: This study analyzed the average impact from all data collected under tropical conditions on the effect of potassium diformate on the performance para- meters weight gain and feed efficiency from commercial and academic trials. The final data-set contained the results of 18 documented studies, comprising 37 trials with KDF-inclusion in piglets and fatteners, at an inclusion rate ranging from 0.2% to 1.8%. These studies were carried out between 2003 and 2015 in Australia, Brazil, China, Philippines, Thailand and Vietnam under both commercial and institutional conditions and included more than 3620 pigs. The results are expressed as the percentage difference from the negative control. 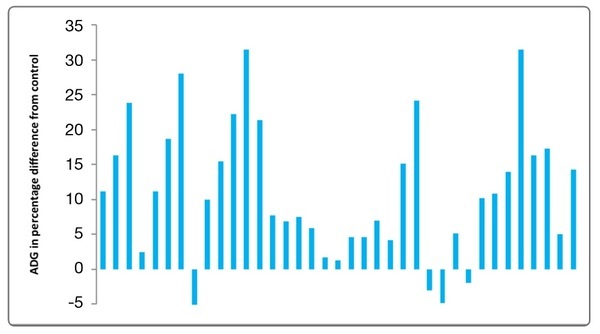 Data were analysed using the t-test and a confidence level of 95% was defined for these analyses. Results and conclusions: The average level of dietary KDF from the data-set in all treated pigs was 0.80%. Daily gain was significantly increased by 11.2% (P<0.001). Furthermore, the FCR was also significantly improved (6.3%; P<0.001).